I apologize if this has been posted already. I just found these excerpts interesting. A police motorcade traveled to the nearby home of Betty and Dustin Day. Betty Day said investigators questioned her about a recent sleepover Celina had attended. From there, law enforcement officials continued farther down the road and searched camps in the woods. Outside a three-story apartment house where the Cass family lived, a State Police major crime unit van arrived, and technicians wearing booties entered the building. Debbie Whelan, who dialed 911 after Celina’s older sister Kayla went to her house looking for the missing girl Tuesday morning, said community residents continue to pray for her return. So, her own parents did not call 911? Authorities say more than 150 tips have poured in as the search continues this morning. New Hampshire authorities plan to talk to every person in the tiny town of Stewartstown, N.H., for clues about Celina Cass' whereabouts. "Every house, every individual in the neighborhood is being spoken to," said Jane Young, New Hampshire's assistant attorney general. More than 100 searchers are now involved in the manhunt for the 11-year-old girl who was last seen in her bedroom at her computer on Monday night. The FBI is involved in the search and so are the Royal Canadian Mounted Police. The town of just 800 people is only a mile from Canada. So far, this extraordinary effort has turned up nothing. Court documents obtained by ABC News reveal that Celina's stepfather, Wendell Noyes, has a troubled past. Noyes, 47, was involuntarily committed to a hospital in 2003 because of schizophrenia and arrested for threatening an ex-girlfriend, according to court documents. Noyes was charged with violating a protective order held by his ex-girlfriend and for criminal trespassinig, criminal threatening and hindering apprehension. The girlfriend, who lived with her two kids at the time, said that Noyes broke into her home while she was sleeping, lifted her mattress and slammed it down and then threatened to throw her down the stairs. While awaiting trial, a judge ruled Noyes incompetent to stand trial and ordered him to be involuntarily placed in a hospital. Judge Richard Hampe wrote that Noyes' mental illness creates "a potentially serious likelihood of danger to himself and others." A forensic examiner deemed Noyes a paranoid schizophrenic who likey developed his mental illness while in the Air Force, according to court documents. Noyes has not been named a suspect in the disappearance. No suspects have been named at all. This is the only picture I could find of mom. why don't mothers stop bringing dangerous men into their homes to harm their children? same old story, just different characters..
Celina Cass' home sat empty, surrounded by police tape and guarded by a state trooper. 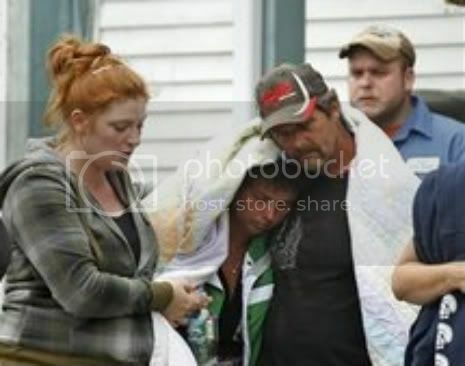 Her family stayed elsewhere during a third day of community-wide searches as townspeople continued to pass out fliers of the girl, who was last seen when she went to bed Monday night. So . . . what are the monkeys' thoughts on this case . . . any ideas? Although the authorities say the family isn't involved, I honestly do not believe that . . . too strange. Police said there's no indication that Celina ran away or that someone took her, and there were no signs of a struggle. But the FBI brought in its child abduction rapid deployment team with agents from Virginia, New York and Philadelphia. A cousin is helping hand out bottles of water. There is no mention of the step-pop or mom contributing to the search. The "wheel chair" did not develope until after the interview, IMO. I am trying to be discreet. An answer for all of you who have asked... The personnel leading the search efforts tell us that they discourage members of the public from heading to Stewartstown to take part in the search. They said that bigger numbers of untrained people can end up being counterproductive. The teams they are using are specially trained to look for certain things. They are extremely thankful to all of you for your suggestions and offers to help them out. @LB Yes. They have searched several ponds including Back Pond. Okay ~ I know this is serious, but the *arousal alert* is too funny sounding. . . .love the *happy* banana, teehee. . .
Another odd thing (to me) is her bio dad is in the hospital, and we have heard nothing......I recall when this first made the news *someone* interviewed (not family) said there was no way she'd leave, as her Dad was hospitalized. Sounds as if they are close. I'm just thinking aloud with all this stuff. Hopefully, authorities know much more than we do! The search is intensifying for a young girl who vanished from her home in a small town in New Hampshire. NBC’s Michelle Franzen reports. News 9's Mike Garrity reports that there is no word from the AG on when they might be giving another update. @MEB-Oregon When WMUR spoke with Celina's aunt at the family's home on Tuesday afternoon, she said that Celina's mother also saw her that evening and that they previously were watching TV or a movie together. Do any Monkey's have a guess why the search is within "a mile from her home" read on comment section on above link. Is the aunt (in the article) related to the mother, by any chance? I am curious where the hill are the truck and the car? The last reported the car and truck had yellow tape around the vehicles. I am dense, is LE awaiting a search warrant to transport the cars? They must have search warrants for the house. This is a very small community of 900 people, someone must have seen something or heard something. Page created in 10.147 seconds with 19 queries.